Qual uso o qual governo al mondo neiga. Qual crudeltà per tempo o qual più tardi. C'a sì bell'opra morte non perdoni? Amor, pietà, mercè, cose sì rare. Fill my heart with strong hope. Love, piety, mercy, things so rare. 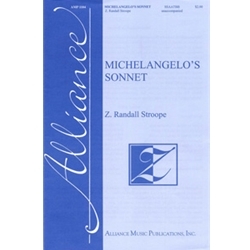 Z. Randall Stroope is an American composer, conductor and university professor. His composition teachers were Normand Lockwood and Cecil Effinger, both students of Nadia Boulanger, the famous French teacher (and student of Gabriel Fauré). He is the artistic director of two European summer music festivals, has conducted music for mass at the Vatican on numerous occasions, as well as annually conducting at Carnegie Hall, Chicago Orchestra Hall, and many other U.S. and international venues. He has 180 published works and has received numerous composition awards. Recordings of his music can be heard on his web site (www.zrstroope.com), or other social media sites.